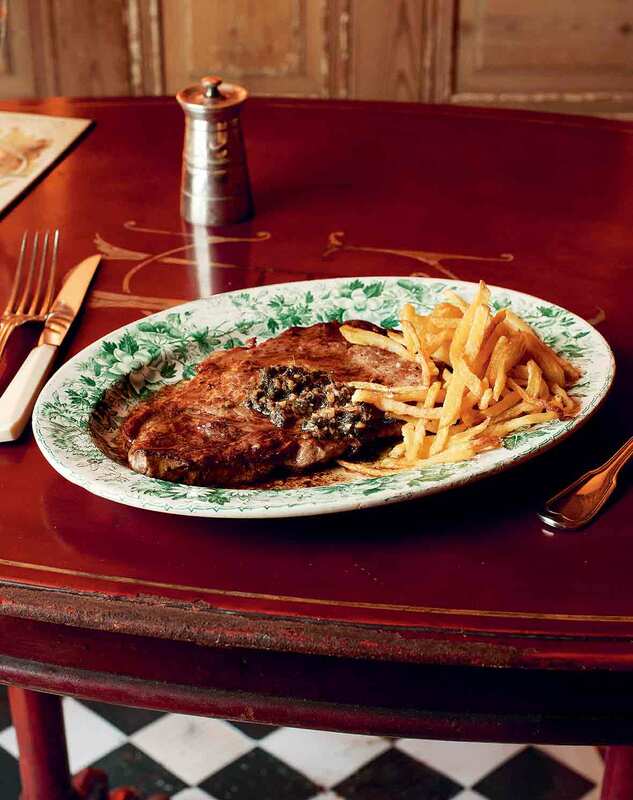 This entrecôte à l’anchoïade is a French classic composed of pan-seared rib eye steak infused with Cognac and butter and topped with an umami-rich sauce of anchovies, oil, garlic, fresh herbs, and red wine vinegar. *NOTE: What Are Entrecôte and anchoïade? Entrecôteis a French word that literally means “between the ribs” but also refers to a particular cut of beef. It’s the same cut as a boneless rib eye but is usually much thinner. For this recipe, be sure your steaks are no more than 5/8 inch thick or ask your butcher to cut them for you. The accompanying anchoïade is a traditional sauce from the Provence region in southern France made from a purée of salty anchovies, grassy olive oil, and pungent garlic. 1. In a small nonstick skillet over medium-high heat, warm 1 tablespoon oil. Add the anchovies and use the back of a spatula to mash them to pulpy bits as they sizzle. Stir in the garlic and cook, stirring, until fragrant, about 1 minute. Add the parsley, thyme, and, last, the vinegar, scraping the sides of the skillet with the spatula. Let the mixture cook until the vinegar has nearly evaporated, 2 to 3 minutes. Remove from the heat and let cool for about 10 minutes. 2. Scrape the mixture into a small bowl and very gradually whisk in the remaining 2 tablespoons oil to make a thick, emulsified sauce. If necessary, add a little more oil. 3. In a heavy nonstick or well-seasoned cast iron skillet over high heat, melt a scant tablespoon of butter until hot and sizzling. Carefully place the steaks in the skillet and cook until well seared, 2 to 3 minutes. You may need to reduce the heat slightly if the butter begins to brown too much. Use tongs to flip each steak and continue to cook to the desired doneness, 2 to 3 minutes more for medium rare. 4. When the steaks are cooked to your likeness, swirl the remaining butter into the skillet and sprinkle a small pinch of salt over the steaks. (The anchovy sauce will provide the rest of the saltiness.) Using caution as it may flare, carefully pour the Cognac or brandy into the skillet and stand back. Let it simmer a minute or two so the alcohol cooks off. Remove the skillet from the heat. This is a simple, versatile sauce or condiment that could go with many dishes (steak, chicken, or vegetables). Although many people say they are not fond of anchovies, this recipe just adds a subtle anchovy savoriness to whatever it goes onto and could convert all but the biggest haters. It makes a simple pan-seared protein something special and very French. The sauce can be made thicker or thinner by adjusting the amount of olive oil. I could imagine it thinned to be a crudite dip or even as a simple pasta sauce. I think it might be even better with a little lemon zest and/or lemon juice. We served it with green beans and small potatoes, which also go well with anchoïade sauce. What's not to love about a perfectly medium-rare rib eye steak quickly pan seared with a butter and Cognac sauce! This was fabulous and a wonderfully quick and elegant meal to put together for two people. Think date night fancy dinner! My steaks were super thin so they only required a couple of minutes on each side to get them to our desired medium-rare doneness. I've never used Cognac before in a sauce and it added such a great flavor. So good! I am also a fan of anchovies and had high hopes for this sauce, however, I felt this "very concentrated" anchovy sauce overpowered the flavors of the steak and pan sauce. I put a dollop of anchovy sauce on my steak and, after tasting it with the steak, I ended up scraping it off. I will definitely be serving this steak again, but next time without the anchovy sauce. I served the steaks with frites and steamed broccoli to help cut the richness of the steak and fries. This steak is a definite keeper in my book! Serves 2 people perfectly with the steaks that are nice and thin. This is a lovely reminder of how good, yet simple, steak frites can be. It’s so easily upgraded with this intense anchovy-based sauce. You might seek out the wisdom of a trusted butcher, because getting a nice rib eye makes this a Friday night or even special occasion-worthy dinner for two with a bonus of a little leftover sauce. The results were lovely, and even though I thought we might have some leftover meat, there wasn’t a bite left on the plates. We served them with air-fried skinny fries cut from red potatoes and a fava bean salad on the side. I used ordinary tinned anchovies (2 cans from Trader Joe’s which held 6 to 7 anchovies each). I was a bit scant on garlic (only had one huge clove), but it was plenty. Once the sauce is made and set to cool, you can prep and cook your sides and then proceed full force because the steak will be cooked in minutes. These just fit in my largest cast-iron pan, and I think I could probably do this with half the butter called for, although in a larger pan maybe you will want it all. The pan juices get a fast reduction, drizzled over the steak then dollops of the anchoïade. We used about half the sauce at dinner and reserved the remainder for bruschetta. The anchoïade took an extra tablespoon of olive oil to reach a nice consistency once I had cooked and cooled the anchovy-herb mixture. The meal was perfect, reminding me of the first time I ordered steak-frites years ago in St. Paul de Vence, sitting outside watching Pétanque. We made up for not being in France this week by opening a special bottle of wine. This is not a sauce that will appeal to everyone. Even if you love, love anchovies, you may find this sauce a bit overpowering. I served it with a beautiful piece of Uruguayan rib eye, that, if truth be known, did not need a sauce to make it delicious. I followed this recipe for how to cook the steak and it was perfection at 130°F in the center. I made a ratatouille Tian that was delicious with it. This recipe made a rich, juicy, and enjoyable meal. The steak was very tender and delicious and the anchoïade provided an amazing saltiness. I paired the recipe with Brussels sprouts and fingerling potatoes and a full bodied Zinfandel. The recipe produced 2 servings as promised. However, my dollop of sauce was too much and made some bites too salty. I would recommend a more conservative amount of a teaspoon. When just the right amount, your mouth will sing with happiness. I did enjoy scooping up the leftover sauce onto a baguette. Delicious. 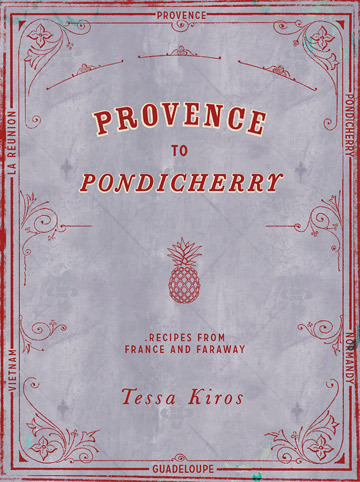 Entrecôte à l’Anchoïade | Steak With Anchovy Butter Recipe © 2017 Tessa Kiros. Photo © 2017 Manos Chatzikonstantis. All rights reserved. All recipes and photos used with permission of the publisher.